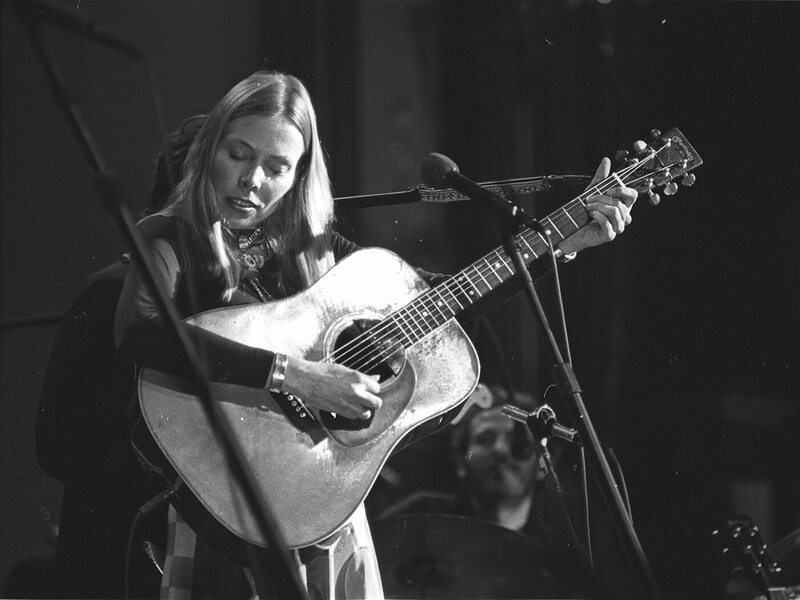 Joni Mitchell pioneered altered tunings in folk, rock and jazz, using open D extensively in her early career. fret on the D string. If you’ve not tried this tuning before, it can be surprising how deep and resonant it can make a guitar sound. We’re thinking acoustic for the most part, but if an electric is all you have to hand, give it a try. Ideally, you want a guitar with a fixed bridge as retuning can play havoc with floating bridges. 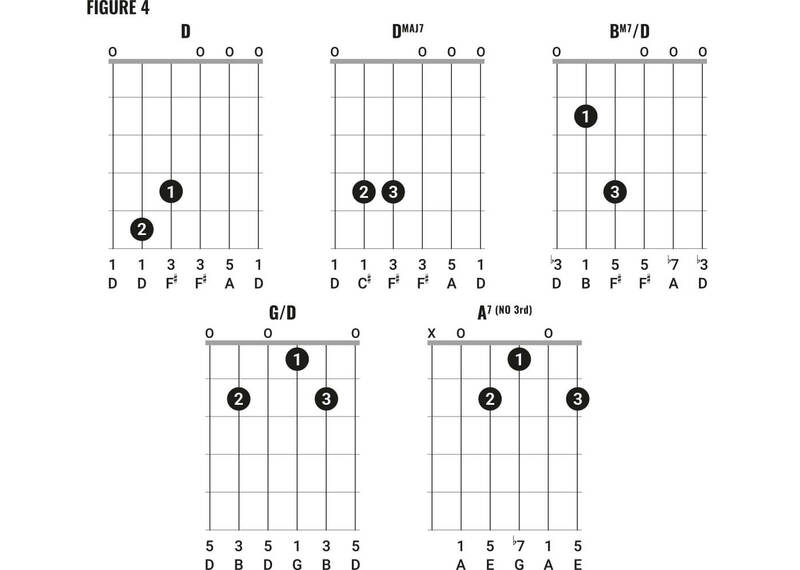 In figure 1, you can move back and forth between the first two chords as often as feels right, and then take the option to land on the open D chord to complete the sequence. Try gentle strumming or fingerpicking, and most of all try a capo, somewhere around the fourth fret. Mitchell was the capo queen – using it on most of her songs either to lighten the texture of chords, or simply to raise the pitch of a song to the point where it suited her voice. Figure 2 is really a two-chord groove, but in bar 2, the Dmaj7 is used to create a melodic flourish between the C# on the second string and the open D on the top string – don’t feel you have to bash away at all six strings all the time. Mitchell’s guitar playing is rarely highly technical, but she is a superb colourist, using the tones and colours of her chords to add interest and support the voice, so think about strumming low, middle and high notes to emphasise the tension and resolution within these chord sequences. Leave the capo in place for this one. let it ring and enjoy that sound. Figure 4 introduces a different, but often-used technique. We have a descending bassline which creates a series of interesting colours against the open strings. Notice that again, Mitchell is not afraid to use a major seventh chord; this sound is still relatively rare in folk and rock. The first three chords should be played one bar each, with the last two sharing the fourth bar of a four-bar sequence. Repeat ad lib, but try the capo around fret two to lighten the texture a little bit. To play figure 5, you need to start on the open-string D major chord from figure 1, and simply alternate the D6 chord. You’ll get the famous Chuck Berry-style alternating major and sixth chord boogie, but it’ll be fatter than ever before as you can play all six strings. The two G chords are there to demonstrate that these can be played as moveable shapes. Try it two frets higher still, for an A and A6 combination. them out in her songs. Figure 7 should start on the open D from figure 1, then go to D6sus4 and D7 and back to D6sus4 – it’s Mitchell showing her rollicking rock ’n’ roll side. Then play the G6sus4 after the barre chord G from figure 5. Then try this two frets higher, to play A and A6sus4 as we did before. Finally, capo the second fret and try it all again. Do you like it more? Capos, like chords, are wonderful things. Check out Part Two of this lesson here.